On the prison world of Zartak, darkness has fallen on arbitrators and inmates alike. The Night Lords have come, and with them the shadow of fear and pain. But they are not the only ones with an interest in Zartak. From the void, running on silent, another fleet emerges. Its warriors are grey-clad and white-faced, and their eyes are as black as the Outer Dark – the savage Carcharodon Astra. As these two packs of ancient, merciless predators stalk the shadows of the prison colony, both seeking a single young inmate with unnatural talents, the corridors run red, and both factions will have to fight tooth and claw to leave Zartak alive. I just finished reading the Black Library’s Carcharadons: Red Tithe by Robbie MacNiven. If you are looking for a book full of Space Marine and Chaos Space Marine action, you are probably going to enjoy this novel. I felt like it really could have been a Space Marine Battles novel, but for some reason was published separately from that line. 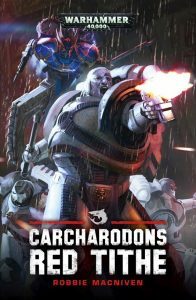 The book involves a conflict between the Carcharadons (Space Sharks) and the Night Lords. Most of the action takes place in a massive imperial prison, which makes for some unique settings and situations. The Space Sharks are a pretty popular chapter, so it’s a no-brainer that the book delves into some pretty cool lore on how they operate and gives them even more personality. Expect a lot to still go unanswered about the Carcharadons though, and that’s a good thing. 40k without mysteries is a bit boring in my opinion. The last time I remember some in depth look at them was in Imperial Armour 10: The Badab War (Part 2). In that book they given some pretty ominous descriptions. Red Tithe builds a little bit upon that and tries to present them as having shark-like behaviors in combat. I think it works pretty well. MacNiven writes combat scenes very well though and I enjoyed many of them in this book, in particular the climax. It’s definitely worth picking up!